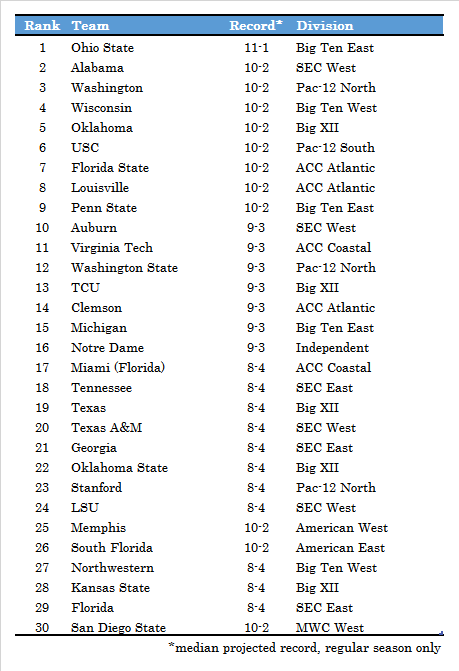 Over the past three years, McIllece Sports has posted the most accurate predictions in the country according to the Stassen Poll, long the standard of measuring college football prediction accuracy, outperforming outlets such as Phil Steele, ESPN, Lindy’s, Athlon, USA Today, The Sporting News, and the preseason media polls. Additionally, since the beginning of the playoff era, McIllece Sports has correctly picked more College Football Playoff teams than anyone else in the country. Since the CFP began in 2014, 8 out of 12 teams we’ve listed in our preseason top 4 have made the College Football Playoff, more than any of the 20+ outlets annually included in the Stassen Poll. As a comparison, famed prognosticator Phil Steele has correctly picked 5 out of 12 playoff teams, illustrating just how difficult it can be to identify the final four in any given season. In the 2016 College Football Notebook, McIllece Sports published win-loss probabilities for every team, something no other outlet in the Stassen Poll provides. (ESPN, with their FPI system, produces projected win totals and conference championship probabilities.) With probabilities assigned to every possible team record, the ultimate test of accuracy can be evaluated: calculating the error in the preseason win prediction, then comparing the actual error distribution to the distribution expected by the preseason win-loss probabilities. If the expected distribution and the actual distribution closely match, then it is shown that the win-loss probabilities were accurate. More than half the FBS teams were projected to within one win, and over three-fourths of teams were projected to within two wins. 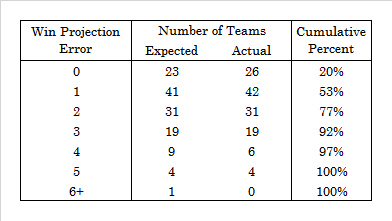 As a comparison, ESPN (the only other Stassen outlet to evaluate its 2016 win projections) was “within one win…for more than a third of FBS teams” and “within two wins for nearly two-thirds of teams.” The McIllece win projections were much more accurate, although it should be noted that ESPN included the eight conference championship games in their calculations, slightly altering the basis of comparison from 826 games to 834 games. Most importantly, the expected number of teams to fall within certain error levels and the actual season results are nearly identical. In other words, the season record probabilities provided in the College Football Notebook are numbers you can trust, and you won’t find a breakdown as comprehensive anywhere else. The 2017 College Football Notebook is expected to be published by the end of June, so be sure to check back in a few weeks. The McIllece Sports top 30 and divisional predictions are posted below. These predictions can also be found (without preceding text) on the Season Predictions page. In the divisional standings tables, AvgRank is the team’s average finish from 100,000 full season simulations, and Championship % is how often they won they division in those simulations. The predicted order of finish in each division is based on AvgRank. Power 5 conferences are listed first. Cripes – going to be a long football season in the Scotty Mac household if Northwestern beats Nebraska and Iowa.